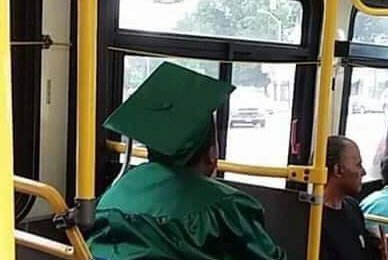 Philadelphia photographer Richard Wah says this image of a recent high school graduate on a bus with no friends or family there to support him inspired him to offer free graduation photos to Philly students who can't afford them. Last May, Philadelphia photographer Richard Wah noticed a handful of recently graduated high school seniors on the bus. They were donning their caps and gowns, but no one was there to support them. In Wah's profession, he's often asked by parents to take professional photos of their kids after their special day. But those kids on the bus had no one. The images stuck with Wah, so much so that he decided to make an offer: He would take free graduation photos for any Philadelphia high school student who couldn't afford them. Only two took him up on the deal. Thanks to a little viral magic, Wah, 44, already has 12 kids lined up for 2017. A Monday Facebook post about the offer has gotten more than 16,000 shares and nearly 20,000 likes. With a team of four barbers and three makeup artists, Wah hopes to give the kids who decide to take advantage of the offer something they'll be able to look back on years down the road. "They're memories; they're priceless," Wah said. The Mount Airy native notes that he didn't have graduation photos taken when he was a teenager because he didn't have the money. But after making a living for himself in photography, he hopes to use his talents to give back. "I don't know who they are or what their stories are. I just want them to know somebody's there," Wah told PhillyVoice. The photography session for 2017 grads will take place June 17. For details, contact Richard Wah Photography at 215-800-3529 or by email at rwahphoto@yahoo.com. Wah said that the offer is not for profit and he isn't expecting money, but he would accept clothing donations for graduates to get their pictures taken in.